At ProTec Dive Center & Advanced Training Facility we offer a variety of services in regards to cenote or cave diving ranging from guided cenote tours for untrained cave divers to guided cave diving services to cave diver training. Cave diver training programs we offer range from cavern diver, intro to cave diver, apprentice cave diver, full cave diver, technical cave diver, rebreather cave diver, ccr cave diver, stage & multi stage cave diver, sidemount cave diver, DPV cave diver to cave survey and cave cartography. Cave diving in Mexico started at the beginning of the 1980’s as the first cave divers from the U.S. arrived to the Yucatan Peninsula, Quintana Roo (Q.Roo) and central Mexico where resurgence rivers such as Rio Mante, sinkholes such as Zacaton and Cenotes such as Carwash, Naharon and Maya Blue where explored. The 1980’s ended with the discoveries of the Dos Ojos and Nohoch Nachich ( Giant Birdhouse in Mayan Language ) cave systems which lead into a long ongoing competition of who has the longest cave, ending up at the 2nd and 3rd biggest underwater cave in the world. The beginning of the 1990’s lead into the discovery of underwater caves on the island of Cozumel, ultimately leading to the 5th biggest underwater cave in the world. By the mid 1990’s a push into the central Yucatan Peninsula by dedicated deep cave explorers discovered a large number of deep sinkholes and deep caves that have been explored and mapped. To this day these deep caves of the central Yucatan remain largely unexplored due to the sheer amount of Cenotes found in the State of Yucatan, as well as the depth involved. In the end of the last millennium CCR cave diving techniques where employed in order to explore these deep water filled caves. 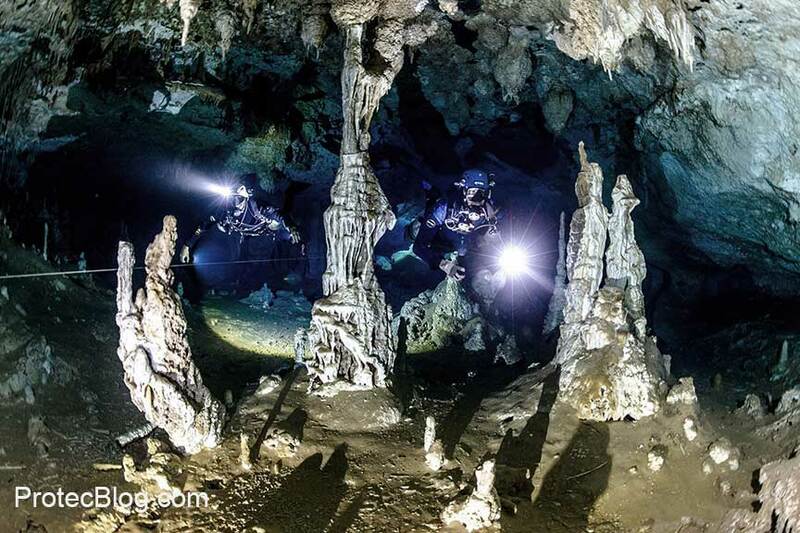 By the end of the 1990’s a new breed of explorers arrived on the scene tackling the longest and deepest cave dives on the central karst plateau’s of Mexico and the Yucatan Peninsula to explore and study these underwater caves. By the turn of the millennia the largest underwater cave on the planet Ox Bel Ha was established by a small group of dedicated cave explores who continuously established new entrances into the cave system by using aerial and satellite images. The then explored underwater cave survey data was overlaid onto these aerial and satellite images to understand water chemistry and the process of cave formation along the coast of Quintana Roo where caves systems discharge their freshwater into the Caribbean ocean. New technology such as Rebreathers either P-SCR or CCR and deep going DPVs became available and where utilized to push back the frontier. The art of cave exploration out of jungle base camps became refined, Ox Bel Ha was becoming explored, ultimately becoming the largest water filled cave in the world in the last millennium. The new millennium is showing that exploration is far from over, mini projects are happening many times a year organized and conducted by the most committed cave explorers with new discovery’s being surveyed and mapped. 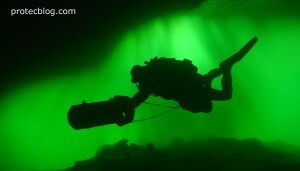 In 2006 and 2007 a number of large previously explored and mapped cave systems have been connected during cave dives done by very dedicated cave diving explorers utilizing sidemount and many times no-mount cave diving techniques in order to pass through these tight cave passages, creating the second largest connected underwater cave systems on the planet, Sac Actun. New technologies introduced into cave diving at the end of the last millennium becoming common place during today’s cave exploration projects. Many cave maps have been published, cave exploration conventions are being held and the future will tell us what is coming next.